We will be closing this form on August 3rd. If you're interested in helping us, make sure you get on our list before then! Challenges run for 24 hours and run from midnight CDT to midnight CDT. Challenge sign up will close July 28th at 11:59pm CDT. Join us tomorrow on the Google+ on-air chat! Tomorrow, Monday, July 21st at 8:30pm CDT (time zone conversion), we're going to have a Google+ #boutofbooks on-air chat. Learn the secrets of the tentacles! At 8:30pm CDT (TZC)! On Google+! 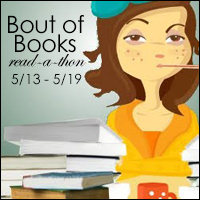 Don't forget the Google+ #boutofbooks on-air chat! This is your friendly reminder that you can ask your Bout of Books questions in ONE WEEK on July 21st. On Monday, July 21st at 8:30pm CDT (time zone conversion), we're going to have a Google+ #boutofbooks on-air chat. So join us on July 21st. Ask your Bout of Books questions on July 21st.